Pablo Sandoval. Hanley Ramirez. Kung Fu Panda. Hanram. However you refer to each player, get used to saying their names a lot. Both will be in Boston for at least next 4 years. Will that be a good thing or a bad thing for the Red Sox? Lets discuss. 1.) Thump in the lineup-These two signings can only help an offense that ranked 11th in the AL in runs scored. At their best, these are two of the top hitters in the game. Last year, no Red Sox outfielder hit double digit homers. Hanley Ramirez, in a down year, hit 13. In a lineup that already consists of Ortiz, Pedroia, and Napoli, Sandoval and Ramirez will see plenty of pitches to hit. The additions of these two hitters also lengthens out the Sox lineup. In the 2015 lineup, Napoli could potentially be the 6th hitter (Betts, Pedroia, Ortiz, Ramirez, Sandoval, Napoli...). On the 2014 team, he was the cleanup hitter/5th hitter. This truly speaks to the depth this new Boston lineup will have next year because of these two signings. 2.) Focus on pitching- Now that the Red Sox have acquired two of the best bats on the market, it allows the team to focus on its greatest weakness:starting pitching. As of this moment, Joe Kelly or Clay Buchholz would be the opening day starter. I can't imagine that sits well with anyone. The Sox need an ace and a number two really badly. Fortunately, signing Sandoval and Ramirez this early in the offseason allows them to spend the rest of their efforts on acquiring pitching. 3.) Clutch hitters- Now for the main reason these guys were brought in: to crush postseason pitching. Sandoval, a former World Series MVP, is a career .344 hitter in 39 games in the playoffs. Ramirez isn't too shabby himself. He is a lifetime .356 postseason hitter in 13 games. Sandoval's OPS is an otherworldly .935 while Ramirez's is an astonishing 1.031. To keep it short and simple, these guys can flat out rake when push comes to shove versus the best pitching in the game. If the Sox make any postseason run in 2015, these two will play a big part in it. 1.) Over payed- While most players in free agency are over payed, these two contracts may take the cake. 4 years and 88 million for Ramirez? 5 years and 98 million for Sandoval? Don't these type of big contracts go to players who are consistent performers and are among the best at their positions? Well, I guess not. Sandoval and Ramirez are both great talents but they have both not consistently performed and are not deserving of these contracts. 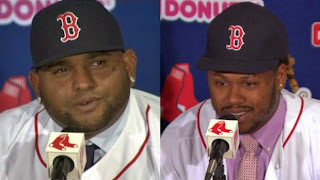 If these signings don't allow the Sox to resign say Jon Lester, Sox nation will be outraged and rightfully so. 2.) Lack of regular season production- As noted above, Sandoval and Ramirez are two of the best in the postseason, a main reason why they received these contracts. The regular season has not been so kind to the two players. Lets play an identification game. Player A hit .280 last season with 13 homers, 59 runs batted in, and had a .343 OBP. Player B hit .279 with 16 homers, 73 runs batted in, and a .324 OBP. Player B? Pablo Sandoval. Player A? Lonnie Chisenhall. That's right. The 3rd baseman of the Cleveland Indians put up comparable numbers to Sandoval and he did it in 100 less at bats. Chisenhall is a nice player but the Sox brought Sandoval in to be a top 3rd baseman (and payed him like one). Sandoval needs to do a lot better than that as the Red Sox will be heavily relying on him in the middle of the order. Hanley Ramirez, on the other hand, performs in the regular season when he plays. The key there is when he plays. Here are his games played of the past 4 seasons: 92, 157, 86, and 128. That is an average of 115.75 games played per year. Ramirez has been hit hard by the injury bug over the past 4 years. As he enters into his thirties, was it smart to give this man a big deal when he could not stay healthy in his twenties? 3.) Positional dilemmas- Another reason these moves do not make sense for the Red Sox is the positional issues this will cause. Pablo Sandoval was signed to be the third baseman and this deal makes some sense. Brock Holt had a nice year, but he is much better suited to be a utility player. Will Middlebrooks time in Boston may be coming to a close. The Sox just could not rely on him to be the man at 3rd. The Hanley Ramirez signing did not make any sense at all. The team is committed to Xander Bogaerts at shortstop and unless a trade comes up that they can't refuse, he will be the guy at short. Ramirez has played 3rd before but Sandoval was just signed. Getting creative, Boston will try Ramirez out in left field. This could cause many problems for the ball club. First off, the team has an excess of outfielders as is. Cespedes, Craig, Bradley Jr., Castillo, Victorino, and Nava are all vying for a spot come 2015. Despite all of those outfielders, Ramirez is given the left field job. The logjam of outfielders will have to be dealt soon. Secondly, Ramirez has never played the outfield before. If he is not capable of doing so, the Sox have nowhere to move him. Thoughts on the Sandoval and Ramirez signings?